I’ve been surfing through the web to find the crown jewels of the dark side of the branding company ideas men. Wherer are good branding consultants when people need them? Please guys, don’t be cruel. 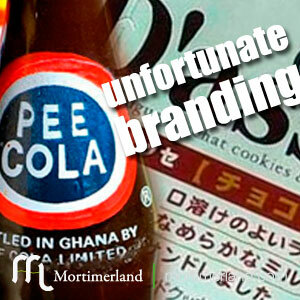 There might be an abstract reason to name a beverage company as Pee Cola; the problem is nobody sane can’t find it. Well, to be honest, I can thought about a couple of reasons, but… forget about it. And what about Shitto or Couque D’asses, they look very tasty for the English-speaking market. But, definitely, my favorite one is Retardex. It’s perfect, I’ve no words to explain what my feelings are. The tears over my cheeks speak for themselves. The ways of company branding creation are inscrutable. This is Micawber´s word. I know, I know… You might be asking yourselves what kind of “peyote” where those branding strategists taking while designing these brands. Don’t worry about it, men, there is no answer. Probably the mistake was thinking about a single aspect of the whole brand while forgetting about the rest of the world, or probably they where thinking about an english brand from a foreign language point of view. Who knows. In my opinion, they were just fake ideas men who tricked a fool, somewhere in the chain of command of a company. Sometimes something goes wrong while naming a comapny. I've been surfing through the web to find the crown jewels of the dark side of the branding company ideas men.